I had to find out who makes these cards, so I did some digging around. They are made by D-Bros and they design all kinds of stuff, like paper clocks, vases, and notebooks (check out their Products section). 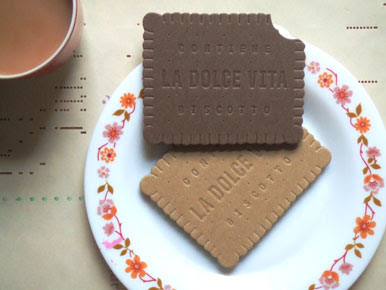 You can see more pictures of the biscuit cards over at kok-design.jp. Seriously, I need these. And how about some chocolate cards also designed by the same folks?